Galene goes West: Carriacou still! Thursday - we should be lifted out today. 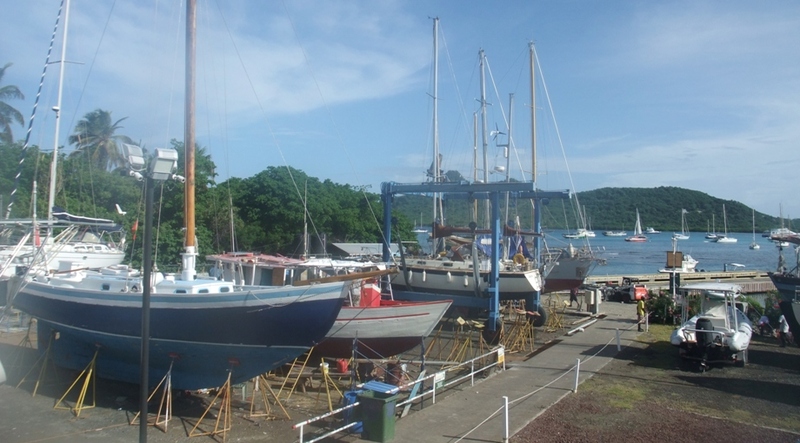 Our morning check in with the boatyard reveals that there are still 2 boats to be launched before we can come out. So it finally looks like things will happen later in the morning. But things never go smoothly. On the way to check with the boatyard our outboard fails just before we reach their dock. We are gratefully rescued by a local before we drift onto the reef! 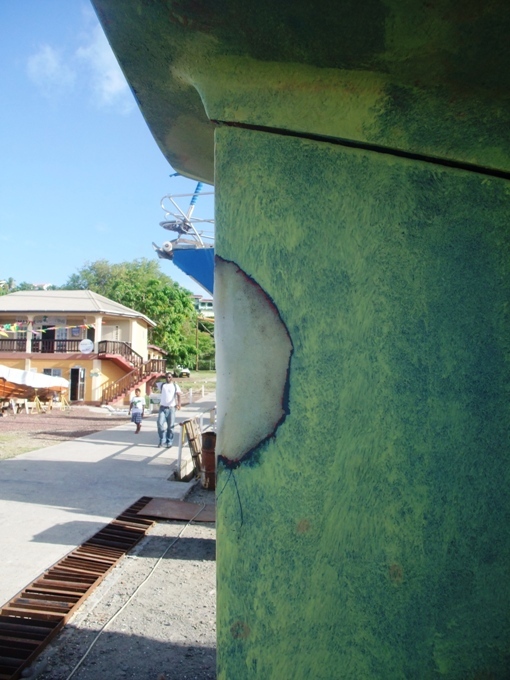 There is no time to look at it now so we get Manny the boatyard engineer to check it out for us. (Diagnosed as water in the fuel). Vince gives us a lift back to Galene and we are off to the boatyard for our haul out. Not so fast! One of the boats being launched has a problem and has to be lifted out again. Oh no, we are now parked on the dock so nobody can go in and we must come out! 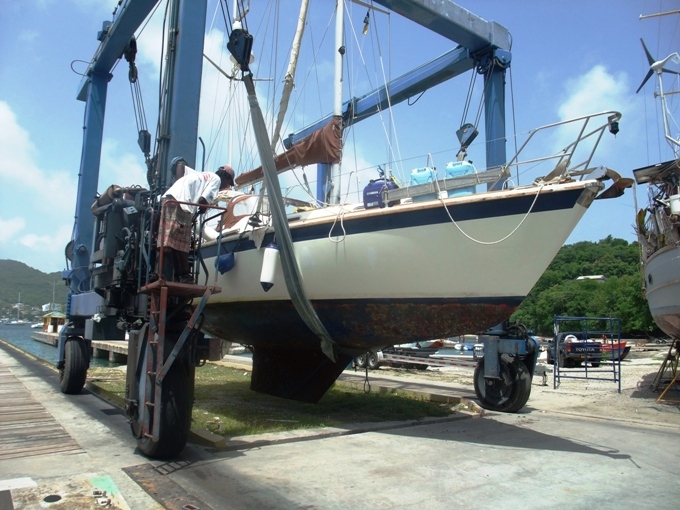 Lifting us in the travel lift is going to present a slight problem: as we are facing forward it looks like the forestay will have to be removed, if we go in backwards then the mizzen will get in the way. Which mast do we want to de-rig? 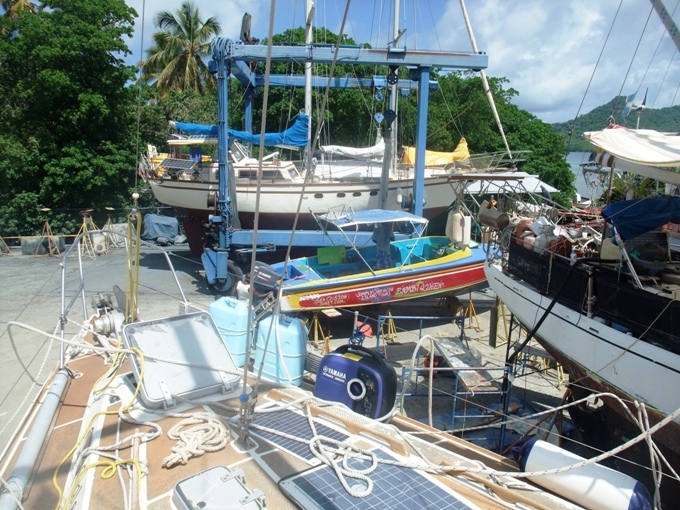 We elect to remove the forestay and the yard goes off to lunch! We will be lifted on their return. Finally Galene rises from the water. 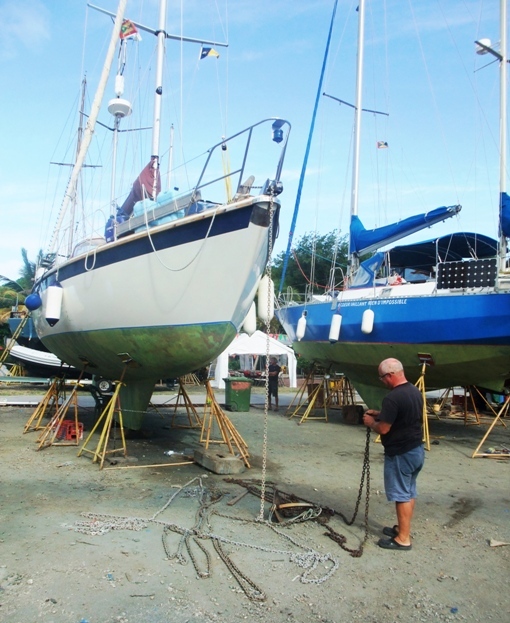 We have lost most of Thursday but at least we are out, washed off and ready to start the prep for the antifoul paint. As a postscript to our previous blog, the weather system that we were all watching passed a long way north of us, unfortunately bringing heavy rains which caused several landslides in Dominica. Many swollen rivers resulted in washed away bridges and landslides have wreaked havoc in several villages. Tragically these heavy rains resulted in loss of life. The Dominica Red Cross have asked for donations of food, toiletries and bottled water to help with the relief effort. You can of course give hard cash as well. Back to our lift out, Friday is spent with the skipper servicing seacocks and polished the prop. The yard are short staffed and should have been sanding and painting primer on the hull. The primer needs 18 hours to cure before the antifoul paint can be applied. We are now a day behind schedule and with Saturday a half day and on Sunday nobody works we are going to be hard pushed to get back in in 6 days let alone the 5 as originally scheduled. On Saturday it is the around Grenada race. 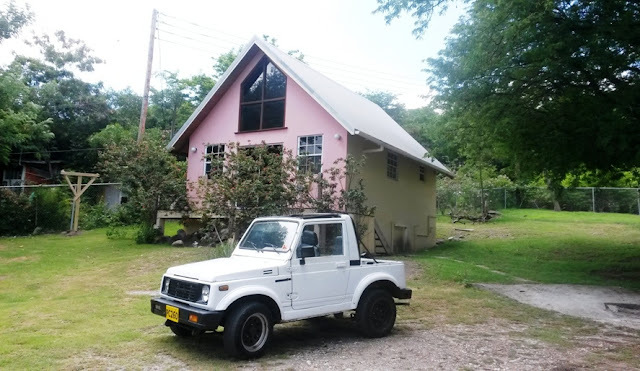 Starting from Petit Calviny on the south coast, the race is up to Tyrell bay Carriacou for an overnight stop, you chose which side to go up (either the east or west coast), returning via the other coast. The party is quite fun with a live band and rum tasting from the sponsors (Westerhall rum). Locals, cruisers and racers alike are all enjoying themselves. As the yard managed to sand and paint primer today, depending on how our painter feels tomorrow, he will come in and paint the first coat of antifoul. Sunday morning and there are a few sore heads around! Vince has turned up to paint but looks decidedly unwell! His conscience getting the better of him he manages to put on the first coat of paint. When he had finished we offered him a cold beer- it is the first time we have had a refusal! “I’m going home to bed” he says. Shame! The skipper still has work to do and the afternoon is spent in the blazing heat polishing the hull. Monday we will finish the small repair on the rudder which is where it was dropped in St Lucia and the filler has come out. Hopefully with a little mat and resin we will have a permanent repair this time. Monday also brings us the second coat of antifoul. We have enough paint for a third coat all over, not just for the waterline, rudder and leading edges as planned. As there is no point leaving paint in the tin we tell the yard to put it all on. The third coat will go on Tuesday and we will launch Wednesday morning 0800hrs! Still time to replace the sacrificial zinc anodes on the prop shaft and fridge cooler, remark the anchor chain and clean out the anchor locker of sand and crud as well as unblocking the drain hole. Meantime, Rowena has moved us into our little cottage just behind the boatyard. 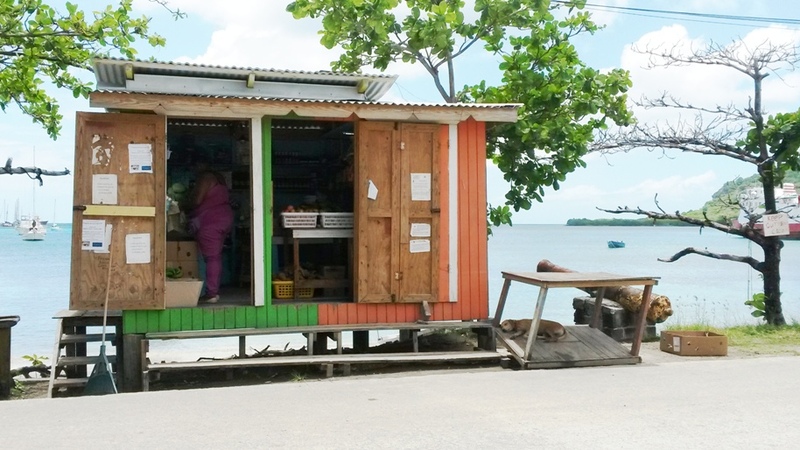 With air conditioning and a fridge even at US$55 per night it was just too hard to resist. Life on the hard in this heat can be awful so now at least we can have a shower, cook, and sleep in air conditioned luxury at the end of a hot hard day. Having unlimited running water is also irresistible, so the cushion covers and all the boat curtains get a much needed wash and we catch up on the handwashing. The laundries out here are sometimes quite harsh so there are some things I never send to them. Wednesday comes and we are launched. We rig the forestay and switch all the systems on only to discover the fridge is not working! We motor out to anchor to tune the rig and call the refrigeration engineer. The diagnosis is that we have lost refrigerant, the system is recharged and we will have to have him back on Thursday to check with his sniffer for leaks. We find no leaks and the fridge is behaving itself, the loss of refrigerant is a mystery. Our plans are to chill here for a couple of days before heading down to Grenada. Chillin’ goes by the board as the skipper suddenly gets a burst of ‘work ethic’ and decides to repaint all the teak. This involves starting painting at 0600 and finishing before it gets too hot at about 1000. Still 2 days of hard work has our rubbing strake, toe rail and grab rails looking like new. The cockpit seating is done one evening before we turn in for bed and all that remains to be painted is the cockpit grating, this can wait until we get to Grenada. A final shop before the weekend and we are ready to head south. Our plans are to stop at the bay North of the sculpture park and snorkel the sculptures before going on to St Georges. The best laid plans etc etc. As we are heading out of the bay on Saturday morning, Vince charges up in a RIB and asks us if we can take some propane bottles to Grenada to be refilled as the regular ferry is not running due to a mechanical fault. We can hardly refuse so instead of spending the weekend at the sculpture park we will now go straight to St Georges to deliver our ‘cargo’. 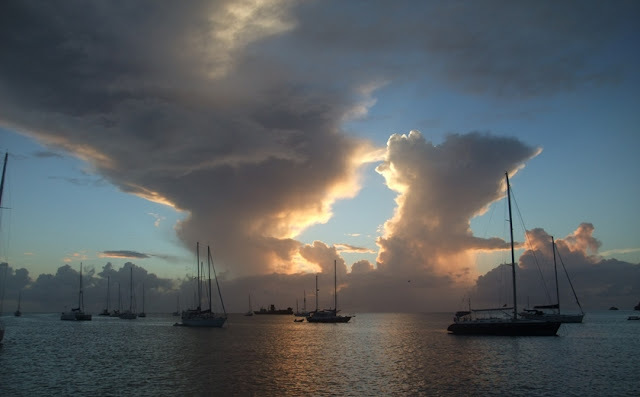 The sail to Grenada is absolutely magic! 5-12 Kts, from close hauled to a broad reach with all sails set, sometimes doing 7kts sometimes just 2.5kts, the tide mainly helping but sometimes pushing us 20deg off course! The sea is calm, the sun is shining and at 1530 we are in St Georges anchorage. It took us a couple of tries to get the anchor to set as the bottom is mixed coral and sand with some rocky patches as well so not the best holding. We are here, our final summer destination before we fly home for a few weeks.